This oil is antiviral, antibacterial, antihemorrhagic, anti-inflammatory, supports the sympathetic nervous system and is an immune stimulant. Cistus oil, Spain, has a strong long-lasting warm and sweet ambra-like aroma. The spicy-animal notes are attractive in oriental perfume bases. 2. Diffuse Rose of Sharon essential oil or apply to the soles of your feet for autoimmune challenges. 7. 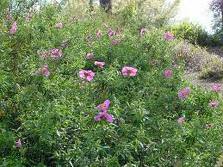 For bronchitis, dilute several drops of Cistus (Rose of Sharon) essential oil with carrier oil and apply to the chest area.